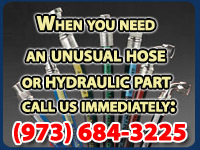 Welcome to American Hose & Hydraulics! We have a known reputation for speedy service and providing quality hydraulic products. We have a complete inventory of hydraulic hose, fittings, valves, cylinders, motors and pumps that are always available to serve the industrial companies in New Jersey, New York and Connecticut. When you need anything hydraulic related, please give us a Call Now at (973) 684-3225 and one of our sales representative will provide you with all the information and a solution to getting your hydraulic equipment working immediately! Our Hydraulic shops are open Monday to Saturday all year long! We Provide a wide selection of hydraulic hose types and hose materials from rubber, metal, specialty chemical to general purpose. We service, repair and manufacture hydraulic cylinders in our own facilities. We supply a full stock of seals and rings to properly fit all hydraulic cylinders. We stock a wide variety of rotating groups, cartridges, shafts, and other parts to ensure faster turnaround time so your hydraulic pump is shipped to immediately. American Hose & Hydraulics manufactures, fabricates and stocks a full line of replacement parts specifically for the sanitation and waste industry. American Hose & Hydraulics provides repair services for all types of equipment, tractor, sanitation equipment or utility truck. Our machine shop service includes fabrications, repairs and refurbishing of almost any type of parts which includes a welding and fabricating department. 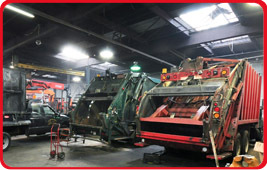 American Hose and Hydraulics provides welding shop services for parts and machines for the East Coast.